Plants annual, or short-lived perennials; cespitose, not rhizomatous. Culms (10)25-150 cm, erect or decumbent, branching, sometimes rooting at the lower nodes; nodes 3-6. Sheaths keeled, basal sheaths usually with papillose-based hairs, rarely glabrous; ligules 0.3-1.5 mm; blades 2-18 cm long, 1-6 mm wide, flat or involute, glabrous, scabrous, or pilose. 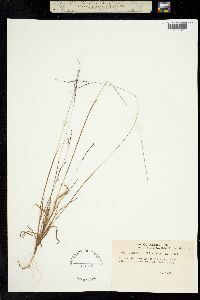 Panicles with 2-7 spikelike primary branches, these digitate or the rachises to 1 cm; longest primary branches 3-25 cm long, 0.2-0.4 mm wide, axes triquetrous, not wing-margined, with spikelets in groups of 2-5 on the lower and middle portions. Spikelets 1.3-2.8 mm. Lower glumes absent or to 0.1 mm; upper glumes 1-2 mm long, from 3/4 to almost as long as the spikelets, almost glabrous or sparsely to densely pubescent with clavate to capitate hairs (use 20× magnification), glume apices rounded; lower lemmas equaling the spikelets, glabrous or glandular-pubescent, 5-7-veined, veins unequally spaced, outer 3 veins on each side closer to each other than the midvein is to the inner lateral veins; upper lemmas 1.3-2 mm, apiculate, dark brown at maturity; anthers 0.3-0.6 mm. 2n = 36, 54. Digitaria filiformis grows throughout the warmer parts of the eastern United States. 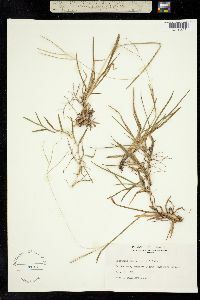 Digitaria filiformis var. filiformis, the most widespread of its varieties, extending into Mexico. Annual herb, tufted 10 cm - 1.5 m tall Leaves: alternate, two-ranked. Sheaths open, keeled. Basal sheaths with bumpy-based hairs. Ligules to 1.5 mm long, membranous. Blades 2 - 18 cm long, 1 - 6 mm wide, flat or with rolled-up margins, parallel-veined, sometimes softly or roughly hairy. Inflorescence: a terminal arrangement of spikelet-bearing branches (panicle). 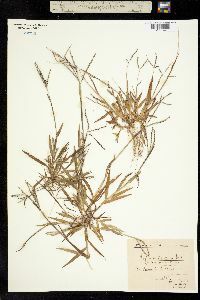 Primary branches two to seven, palmate (or the axis to 1 cm), 3 - 25 cm long, to 0.5 mm wide, spike-like, bearing spikelets in groups of two to five along the middle and lower regions. Fruit: a caryopsis, indehiscent, enclosed within the persistent lemma and palea, flat on one side and convex on the other (plano-convex). Culm: decumbent or upright, branched, 10 cm - 1.5 m long, round in cross-section, occasionally rooting at the lower nodes. Nodes three to six. Spikelets: 1.5 - 2.5 mm long. Florets: two per spikelet. Lower florets sterile. Upper florets bisexual. Anthers three, about 0.5 mm long. Stigmas red. Glumes:: Lower glumes absent or to 0.1 mm long. Upper glumes 1 - 2 mm long, three fourths to nearly as long as spikelet, rounded at the apex, nearly hairless to densely hairy. Lemmas:: Lower lemmas equal to spikelets, five- to seven-veined (unequally spaced), membranous, sometimes glandular-hairy. Upper lemmas brown, 1.5 - 2 mm long, short-pointed at the apex, obscurely veined, with margins that embrace the upper paleas. Paleas:: Lower paleas absent. Upper paleas similar in size and texture to upper lemmas. Habitat and ecology: Found in the sandy soil of woodlands and prairies. Etymology: Digitaria comes from the Latin word digitus, meaning finger, referring to the digitate inflorescence of some species. Filiformis means thread-like.